Choosing SYNLawn®’s synthetic turf for your commercial project is one of the smartest investments you can make for your business. Landscaping can be a major expense and take up a large portion of your budget. Eliminate that expense and our beautiful, natural looking artificial turf will pay for itself in no time at all. No matter what system you have in place, natural grass will always cost you time and money. Most companies have to pay for someone to install costly watering systems, pull out weeds and cut their natural lawn once a week to keep it from looking disheveled. With a synthetic lawn, you don’t have to worry about watering or cutting your grass, leaving you free to invest your money where it belongs: in areas of your business that can engender success. Our artificial grass is less costly and easier to maintain than natural grass, typically saving you up to 70% on your water bill each month. 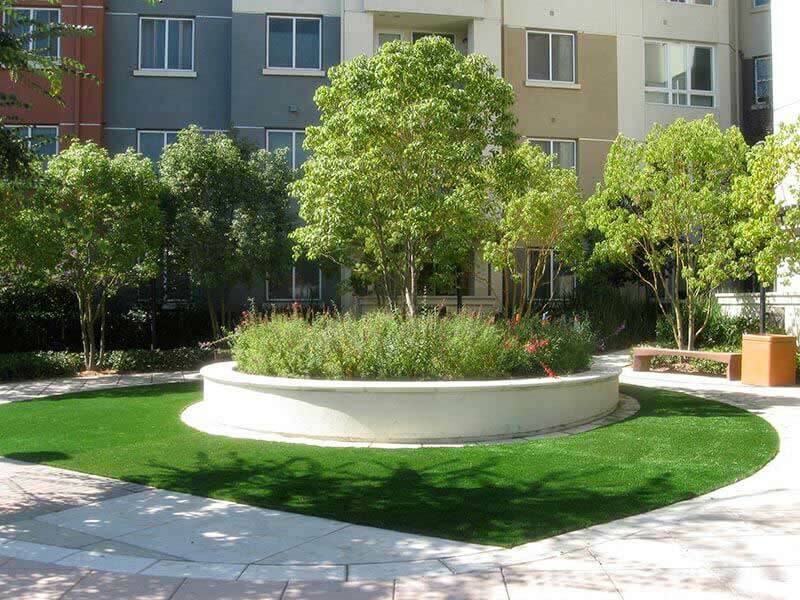 As the largest manufacturer of synthetic grass and landscaping turf, SYNLawn® is the name you can trust to take care of your commercial synthetic grass installation. We have the most technologically advanced grasses produced anywhere, with an unbeatable 8-12 year warranty. It’s time to cut your high water bills and lose the expensive maintenance it takes to keep your natural lawn looking fresh. 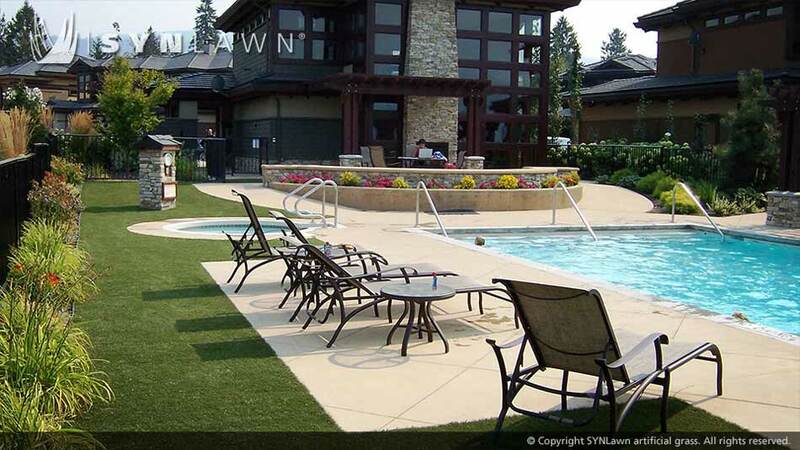 It’s time to choose SYNLawn® for your commercial landscape. Playtime couldn't get much better when romping around on SYNLawn Play Platinum, the ultimate artificial grass playground surface. Jump, skip, run as fast as you can the durability of this turf variety can handle even the roughest roughhousing you or your kids could dish out. Dramatically reducing playground injuries and with additional safety built in including a Class 1 fire-rating and IPEMA Certification, it's easy to see why daycare centers and school districts continue to make the switch from traditional play surfaces to SYNLawn's Play systems. 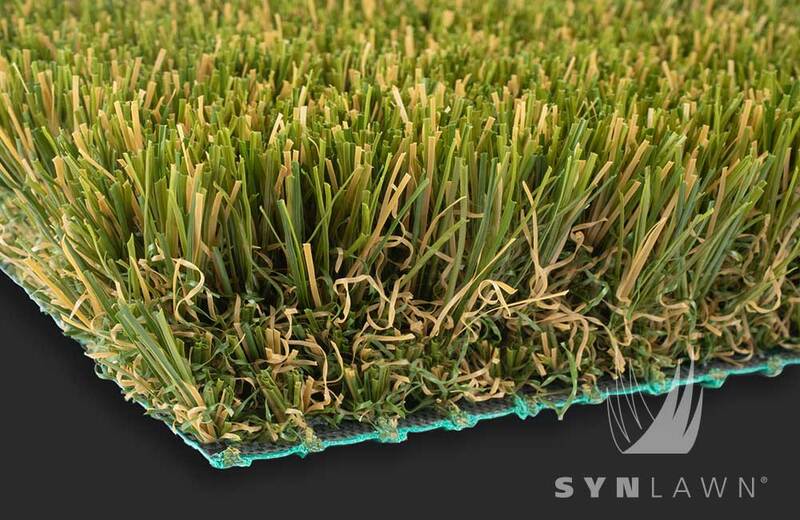 Utilizing cutting-edge technology, SYNAugustine 347 employs a multi-colored fusion of natural grass colors and thick tan thatch zone to create our softest, most realistic looking turf variety to date. At a full 2" pile height, olive, apple, and field green soft omega-shaped grass blades combine with dense thatch create a luxuriously soft and alluring synthetic grass. When installed this turf variety replicates the real thing so closely, it will be a challenge for your neighbors to tell if it's real grass or if its fake. We went back and forth on putting this product in our back yard and now we wish we would have done it sooner! Best money ever spent and now instead of dirt we have a lawn. We tired every type of grass possible and it would not grow in our back yard. We have one big dog and she too is enjoying the new lawn! We had SYNlawn Chesapeake Bay put our product in and it was so worth the money for install. There is a lot to the process and so much before work to make sure it will last. They were so helpful, professional and the whole process was very easy on our end. We highly recommend using them if you are think about buying this product. We are in the middle of winter and have amazing wonderful green grass and not mud!! LOVE IT!! SYNLawn is a fantastic vendor. I have purchased artificial grass from them on several TV productions including ABC's The Black Box and on multiple season's of HBO's Girls. We have extremely high standards in TV production; the grass needs to look realistic- even on HD. SYNLawn's product is outstanding and their customer service is the best out there. Anastasia, the owner, is personable and will jump through hoops to accommodate your timeline. I can't recommend SYNLawn highly enough. If you need artificial grass, this is your vendor. We chose this product because of a 400 sq foot area next to our pool that was too shady to grow grass. On top of that - our dog made a mess of it every time she came out of the pool soaking wet. It was a mud pit. The installation went well and the prodcut has worked eautifully. Despite tropical rainstorms the area drains completely. One of our biggest concerns was developing a urine smell but we haven't noticed that either. When lawn furniture is moved the grass bounces up again nicely. The only chore is that I now need to regularly blow the area to prevent accumulation of leaves - but that is a nice tradeoff for a clean and dry space! We had SYnlawn put in a rounded rectangle of grass with a paver border this month. It was overall a great experience Katie Snead came out and showed us samples of grass that works well with pets, measured, and answered all questions we had then and later. The installers: William, Poncho, and Mario did a wonderful job. The only reason we gave them four is we had a hiccup of the company putting the wrong infill in, but they were great and came back in and change the infill to the correct within the week. Overall the dogs love the grass and it looks great. I definitely would recommend this company. I haven't quit saying great things about this product since it's install, 6 months ago. First, this is quite possibly the best investment I have made for the amount of use it gets. It's expensive BUT the reward is beyond the price and I'll happily pay the future bills related to it because 1) The dogs are clean, through rain and shine, and thus the house is clean. 2) there is a psychological effect to an inviting yard, like an inviting room and we ALL use this yard now. Last year no one would touch the yard. Now the neighborhood kids flock to it and my video game daughter PLAYS in it. I even find myself eating lunch out there and sitting on the swing on nice evenings with my daughter out there. I had multiple companies come out and quote our back yard for turf. They were very competitive and with their coupon you just couldn't beat the price. The sales rep was wonderful and I didn't feel like I was getting a high pressure sales job when I went in the showroom. Install crew was great and they got it done in 2 days. I would highly recommend them. We had one small thing I called about after the install and they were back out there within a couple of days to fix and all is great! They stand by their product. Bringing back an old favorite with a new twist, SYNLawn has gone and done it again with SYNBlue 949. This time we've taken realism to a new level by incorporating tan colored grass blades into the face yarn to create an unmatched natural aesthetic. At a full 2 inches high and 90 ounces this landscape turf variety is soft between your toes and surprisingly durable you won't believe your eyes (or feet). SYNFescue 243 incorporates multi-colored green blades with a realistic tan thatch for the perfect simulation of natural grass. Manufactured combining 'Omega' shaped yarn with our exclusive HeatBlock Technology for lower surface temperatures coupled with our exclusive EnviroLoc Backing Technology to 'lock-in' grass fibers for ultimate resiliency and a lush, beautiful landscape for years to come. 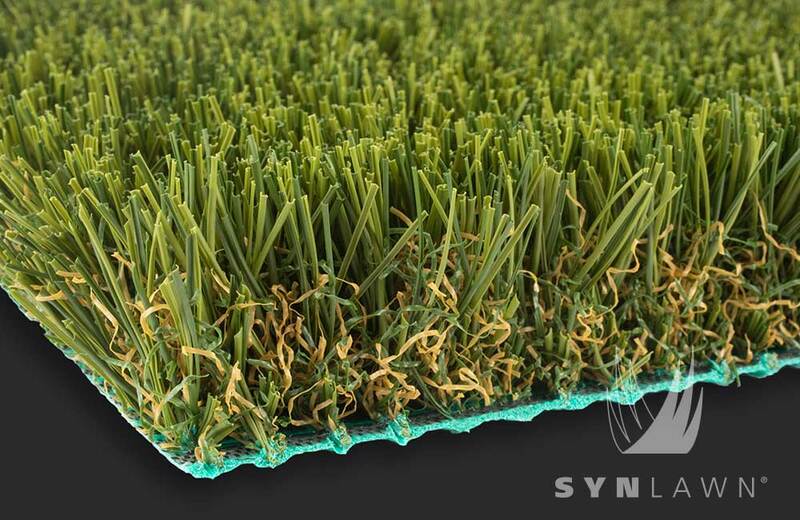 Bringing together the latest in synthetic turf tech and aesthetics, SYNFescue 343 offers the ultimate in performance and natural beauty found in an artificial grass variety. This landscape grass is extremely flexible and durable making it the perfect solution for multiple applications including lawns, rooftops, pet areas and playground installations. This revolutionary product shows amazingly out of the box packing a whopping 120 oz of face fiber for the lushest, most luxurious looking landscape ever. This product is sure to wow residential and commercial customers at first site. The look and feel are phenomenal and the comparison when laid side by side against the competition is staggering. I love having Synlawn Meadow in my backyard. It's has been super easy to care for and super soft so the kids and pets all seem to love it. It's actually better than the shabby natural grass backyard we used to have. Now we actually enjoy spending time together instead of staying indoors. Extreme reliability and performance are two of the outstanding traits for which SYNRye 244 has come to be known. 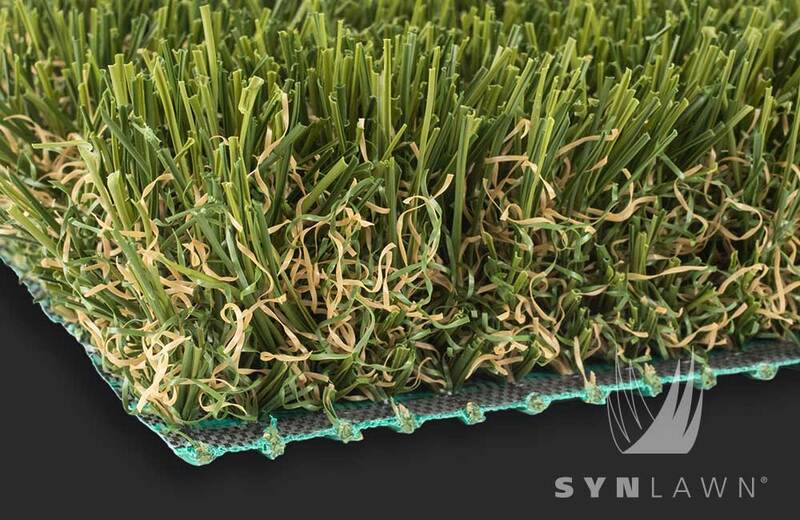 A shorter pile height than SYNRye 200 but with all the same characteristics including vibrant field green and lime grass blades and dense tan thatch made of nylon for long-lasting beauty. This artificial grass is ideal for high foot traffic and works well for even the most demanding applications including rooftops, pet areas, playgrounds, golf fringe and chipping areas as well as any lawn and landscape application. At a whopping 100-ounce face weight, this artificial turf rises above the competition with unmatched durability and softness. Combining multi-color grass blades and dense thatch this grass sits at the top of its weight class. Upping the ante and all-in, SYNZoysia X47 is changing the game by offering unprecedented resiliency and softness in an artificial grass variety. Weighing in at a staggering 100-ounce face weight plus all the benefits and features of SYNLawn's premium turf offerings, this synthetic grass stands alone, unmatched and unrivaled. Recommended for lawn and landscape applications but also soft and durable enough to withstand the rigors of playground applications. Engineered with quality and value in mind, SYNLawn 348 carries all the allure and luxurious features of our premium artificial lawn and landscape grass offerings at a price you'll love. At a substantial 80-ounce face weight, this rising middle-weight star can contend with the best the competition can offer. Unmatched quality and high-performance at a low-price are what makes SYNLawn 648 the "People's Champ" of artificial grass. The perfect lawn and landscape solution for those on a budget while including all the bells and whistles found in the most exclusive turf varieties. Big-time luxury and big-time value, this is the real deal.